Home Article American YouTuber Doug DeMuro Dating A Girlfriend Or He Is Secretly Married? American YouTuber Doug DeMuro Dating A Girlfriend Or He Is Secretly Married? 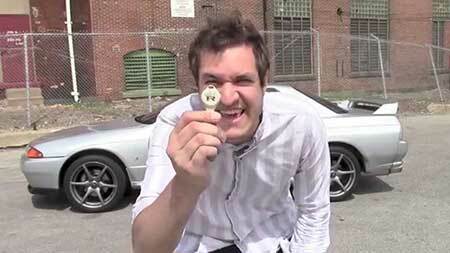 You would definitely be aware of Doug DeMuro if you people have much interest in automobiles. DeMuro explains all the aspects of the automotive industry via his YouTube channel PlaysWithCars. His interest in the automobiles is pretty clear looking at his wedding image riding the most attractive Land Rover Defender. DeMuro announced his marriage via Instagram in June 2017. Let's get details about his married life and more in today's session. If you people are an avid fan of automobiles, you are definitely in the right place. If you have the interest to get knowledge about several aspects of the automotive industry, you should definitely follow YouTuber Doug DeMuro. His social media account is filled with attractive car models in which he shares information about their key features. Most of all, his craze for his Land Rover Defender dragged our attention. Most of his Instagram posts are of the same vehicle which is not less than his companion in every possible destination. He was photographed in the same Defender when he got married to his lovely wife, though her face was not displayed in the photo. Well, it's no more a mystery that DeMuro is a married man but what's going on in his personal life? He's ultra-secretive about his family life and wife. We wish to know more about his family life soon! DeMuro gained wide recognition among his fans for his auto blog "PlaysWithCars". He documents several aspects of the industry and he does the same via his self-named YouTube Channel. As of October 2018, he has over 2.2 million subscribers on his channel with millions of views in every single video. He started his YouTube channel on 11 September 2013 and posted his first video on 10 December 2013. His videos solely include vlogs of him reviewing various car models and their respective features. He brings super fancy cars like Range Rover, Mercedes, Ferrari, and Aston Martin in his vlogs. Filmed today with this special one. He published his first satirical and automotive book, Play With Cars on 12 July 2013. The book was circulated to various national literary outlets. He eventually published his second book the next day named 'From My Perspective'. Born on 22 May 1988 in Colorado. He is best known for his auto blog PlaysWithCars where he explains various aspects of the automotive industry. He published his first automotive book published in July 2013. He appeared as a guest star on Matt Farah's podcast The Smoking Tire. He has an estimated net worth of about $1 million.